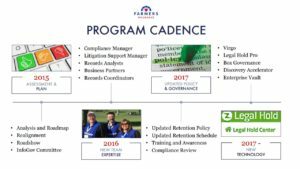 In the last Thursday breakout of AIIM 2018, I attended a session on initiatives within the compliance department at Farmers Insurance to modernize their records management, presented by Rafael Moscatel. Their technology includes IGS’ Virgo to manage retention schedules, Legal Hold Pro for legal holds and custodian compliance, and Box for content governance. They started in 2015 with an assessment and plan, then built a new team with the appropriate expertise going forward, then updated their policy and governance, and finally brought in the three new key technology components in 2017. For an insurance company, that’s pretty fast. 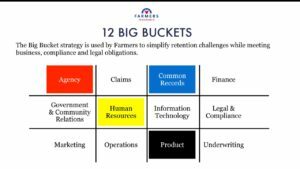 Their retention policy is based on 12 big buckets, which are primarily aligned with business functions, making it easy for employees to understand what they are from a real-world standpoint. Legal Hold Pro replaced an old customized SharePoint system, and works together with Box Governance for e-discovery. He went through a lot of the details of how the technologies work together and what they’re doing with them, but the key takeaway for me is that an insurance company — what I know through a lot of experience to be an extremely conservative industry that’s struggling to transform themselves — is realizing that they need to shake things up in terms of how compliance of digital records are managed in order to move forward into the future. He ended up with some great comments on how to work with the business people, especially the executives, to bring programs like this to fruition. Great talk by a knowledgeable and well-spoken presenter; my end-of-the-day writing doesn’t do it justice. AIIM Toronto runs some great morning seminars every month or so, and today the guest is Else Khoury of Seshat Information Consulting to talk about privacy regulations. In the face of recent privacy gaffes from the Facebook fiasco (the breach that wasn’t a breach) to Alphabet Labs not thinking about where public data that they collect in Toronto will be stored (hello, data sovereignty), and with the upcoming GDPR regulations, privacy is hot right now. Khoury, who brightened our day by telling us that her company is named after the Egyptian goddess of recordkeeping, covered both Canadian and EU privacy frameworks. Xiao Liu from Swinburne University of Technology presented his paper on A Probabilistic Strategy for Setting Temporal Constraints in Scientific Workflows, co-authored by Jinjun Chen and Yun Yang. This is motivated by the problem of using only a few overall user-specified temporal constraints on a process without considering system performance and issues of local fine-grained control: this can result in frequent temporal variations and huge exception-handling costs. They established two basic requirements temporal constraints must allow for both coarse-grained and fine-grained control, and they must consider both user requirements and system performance. They used some probabilistic assumptions, such as normal distributions of activity durations. They determined the weighted joint normal distribution that estimated the overall completion time of the entire workflow based on the time required for each activity, the probability of iterations and the probability of different choice paths: assuming the normal distributes of events as earlier stated, this allows for the calculation of maximum and minimum duration from the mean by assuming that almost all process instance durations will be bounded by +/- 3 sigma (sorry, can’t find the sigma symbol right now). After aggregating to set the coarse-grained temporal constraints, they can propagate to set the fine-grained temporal constraints on each activity. There are modifications to the models if, for example, it’s known that there is not a normal distribution of activity durations. This becomes relevant in practice when you consider setting service level agreements (SLAs) for processes: if you don’t have a good idea of how long a process is going to take and the variability from the mean, then you can’t set a reasonable SLA for that process. In cases where a violation of an SLA impacts a company financially, either immediately through compliance penalties or in the longer term through loss of revenue, this is particularly important. I’m eager to learn more about the relationship between policies, procedures and rules, and how they relate to compliance, so I sat in on a presentation by Peter Still of RuleBurst. There’s a pretty high percentage of vendors on the speaker roster, but so far the quality has been good so no complaints. The theme of Still’s talk is that the business rules approach will only gain critical mass if it stops being a technical implementation tool and starts being a business problem-solving tool. The current pitch from the business rules vendors is that this is a way to implement systems faster and cheaper, while allowing the business to access some tuning parameters, but this is really focussed on the technological capabilities and not the business value of business rules. This is such a perfect mirror of the BPM field, where BPM has just barely moved from a purely technical sell to something that’s now being sold more and more to the business side of an organization, so I can completely understand where the business rules market is and the challenges that lie ahead in shifting the focus of their marketing message. Worldwide market for business rules product revenue is $250M — not a lot when you consider the size of related markets — and it could be a lot larger if there was greater recognition of the business benefits of business rules. A perfect business case for re-targeting the business rules message is compliance: it’s an enterprise-wide initiative with executive support where business rules can be included in the decisioning at key points of the process. Although business rules aren’t the complete answer to compliance since compliance is a very process-focussed initiative, rules can be a significant contributor to compliance efforts. One of the difficulties with compliance is that many regulations, such as Sarbannes Oxley, are pretty vague since they have to deal with such a broad range of companies, and it’s difficult to determine precise business rules to implement them. Compliance at a transactional level is a mostly automated application of BPM and business rules, but as you move up to risk management and higher-level compliance factors, there’s less automation although still opportunities for business rules to be wrapped in a compliance framework, such as using business rules to classify a risk although the management of that risk may be done manually. Still maintains that there’s a link between transactional and operational compliance, and believes that business rules can help with that link although that’s not recognized by most business rules vendors. As with most other complex applications of technology, you can solve this with an integrated compliance and rules solution from a single vendor, or go for a best-of-breed approach. Still recommends the former approach, and invited us to drop by his booth to check out what RuleBurst has to offer in this area. I spent some time this morning with the guys from BWise, which turned into a very informative session. Although FileNet has partnered with them primarily for their compliance solution, they do so much more in the entire area of internal controls. The compliance frameworks certainly are impressive, though. I’ll definitely be taking a closer look at this. I’m currently sitting beside the pool at Caesar’s Palace, and although I don’t think that it’s warm enough to be dressed the way that some people are (or aren’t, to be more accurate), it’s a nice respite from the conference crowds for a few minutes before I head back to the sessions. This morning’s BPF hands-on session was so full that I didn’t get near a computer – better to let the customers at them first — and I’m surprised the FileNet didn’t anticipate this level of interest in the labs. I’ve talked to a lot of UserNet first-timers, and they’re all a bit overwhelmed by the amount of information but seem to be getting a lot out of it in general. Off to an afternoon of BPM and BAM sessions. Okay, that was a bit longer than two weeks. As well as taking some time off to entertain a friend visiting from Australia, I’ve been immersed in some client work and the development of a BPM course that I can offer on a wider basis, both of which have me looking at BPM, corporate performance management, compliance, enterprise architecture, process modeling, and a host of other things. Compliance has been of particular interest lately, because every client that I deal with now is focussed on it. There’s a good deal of compliance mania going on, very reminiscent of Y2K mania, where vendors start every presentation with a picture of a CxO doing the perp walk and proceed to scare the bejeezus out of their customers until a blank cheque falls onto the table. I’m not saying that compliance isn’t a serious issue, and that there aren’t cases of non-compliant companies suffering under fines (and worse), but can we ease off a bit here? There’s a lot of other compliance selling points that don’t look like some corporate version of Fear Factor. I think the worst part is that the vendors selling compliance solutions are not, to use the industry vernacular, eating their own dogfood. Friday’s business news recommended selling Open Text short, in part because of their lack-lustre performance lately, but mostly because they’re seeking an extension on meeting their SOX compliance requirements. As the analyst in the article points out, that’s not a good thing for a company that builds compliance software. Try to imagine, if you will, the hapless Open Text sales force the next time that they try to sell compliance to their customers: “do what we say, not what we do” isn’t a particularly credible marketing slogan. Open Text is a public example of this, but if you dig into any of the compliance vendor organizations, you will almost certainly find non-compliance: irregularities in contract negotiation and management, failure to implement proper records management (especially email) policies, and countless other infractions. In other words, few (or none) of them are in any position to be taking the high ground when they’re talking about compliance. I had several appointments and errands today, and I listened to podcasts as I walked around downtown Toronto. One of them was the Sound of Vision podcast from back in May wherein Ethan Johnson interviews me about BPM (starting at 21:00 in the ‘cast), and there’s one point where I get really passionate about the fact that everything is a process: my true evangelist colours shining through. 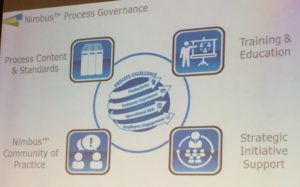 I do have a very process-centric view of business, to the point where some work that I’ve been doing recently on compliance started out being about content and records management, and has shifted to have a very strong focus on process. I also saw an article this afternoon by Terry Schurter of BPMG, and he states that BPM and a process-centric view are so popular because such a high percentage of BPMS implementations (compared to other enterprise software) deliver on their promise of ROI. 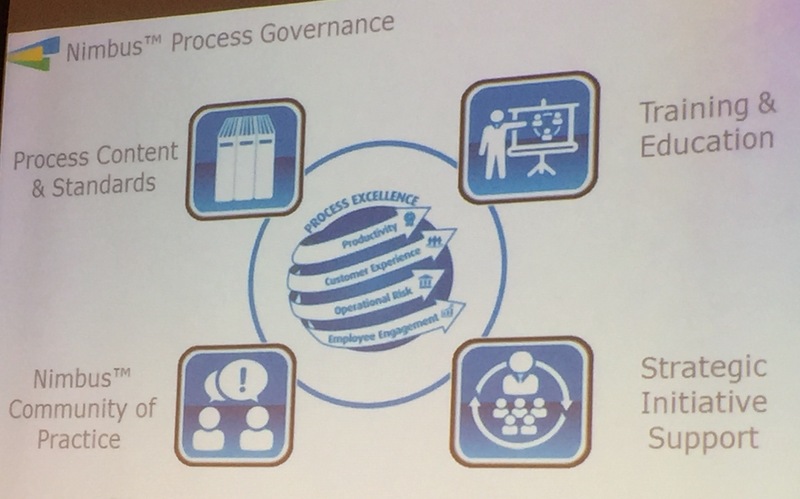 His view is that taking a process-centric view — “the idea that businesses can be viewed as a series of processes, and that those processes can be identified and managed to improve quality, efficiency, and cost-effectiveness” — resonates with end-user organizations, vendors and analysts, and that BPM aligns with the natural business structure. It seems that you can’t pick up a business or technology article these days without it containing some reference to process, which means that Terry and I are not alone in our views. 98% agreed that pre-defined templates accelerate BPM deployments. 73% answered definitely “yes”, while the other 25% said “maybe”, and only for simple or standardized processes. I’m curious to know what the 2% “no” contingent was thinking, since it’s hard to imagine anyone not seeming some potential value in a pre-defined solution template. Although few people expect templates to be an application rather than a project jump-start, 70% expect them to be a fairly complete framework with screens, rules, integration adapters and the like. In other words, the respondants definitely expect the templates to be customizable, but they want to have a pretty high starting point. 70% stated that they would be more likely to buy a software solution that had process templates specific to their industry, which seems obvious but is something that many vendors haven’t figured out yet. 76% agreed that the templates should be documented in “business” language rather than being a tool for IT, and one of the key values stated for process templates was to align busines value with IT. Not surprisingly, SOX compliance was at the top of the list of which processes should be templated, although the votes were pretty evenly spread over all of the business processes surveyed.